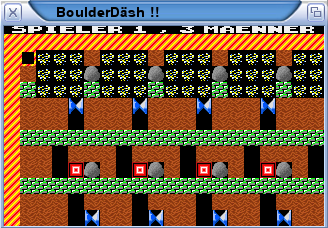 Description: Very high quality BoulderDash clone. All reachable C64 veterans agree "Best boulderdash on C64, eh Amiga!" so there is no need to download any of the additional archives. - Full sound card support (AHI)! - System friendly! Can be paused and resumed at any time. - Unique record and play feature to show others how you solved the caves. - Optional full screen mode when running in RTG mode. - Supports C64 and Atari Construction Kit Level and game files.